Every diehard Florida State University fan needs to proudly display their team pride! Why not showcase your enthusiasm in your yard or garden with this beautifully designed team logo garden stake bird bath?! The two piece metal stake includes a three prong base, which will provide some stability for this bird bath when it is staked into the ground. The glass bowl is crafted from embossed glass and has a hand painted team logo. 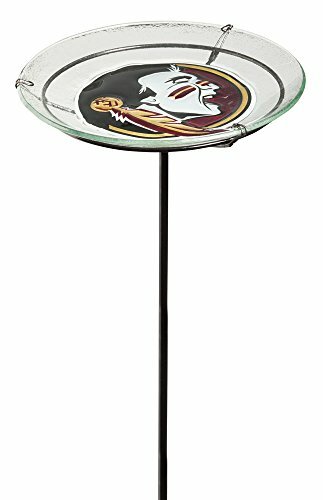 Showcase your team pride in your outdoor space with this Florida State Seminoles Logo Garden Stake Bird Bath. Approximate dimensions when assembled are 11" x 11" x 24"
If you have any questions about this product by Team Sports America, contact us by completing and submitting the form below. If you are looking for a specif part number, please include it with your message.